Dark mornings, even darker nights and the kind of weather that makes you want to disappear under a duvet with a hot water bottle. That’s all we can ever expect from the UK in winter. While some of us might be dusting off the skis or snowboards to hit the slopes this winter, the sun worshippers among us are likely to be shivering at the very thought of it. To help you beat the winter blues, we have researched 10 sizzling winter holiday destinations that are bound to put a tan back on your face. Just don’t forget your sun cream! Located just off north-west Africa, there are seven Spanish Canary Islands to choose from: Tenerife, Gran Canaria, Lanzarote, Fuerteventura, El Hierro, La Gomera or La Palma—each offering a wide range of landscapes, sun-drenched shores and plenty of activities. Blessed with a gentle summer climate, the islands have an average winter temperature of 19 degrees centigrade. Other attractions include two UNESCO World Heritage sites, two World Biosphere Reserves, water sports, volcanoes and Saharan-style sand dunes. 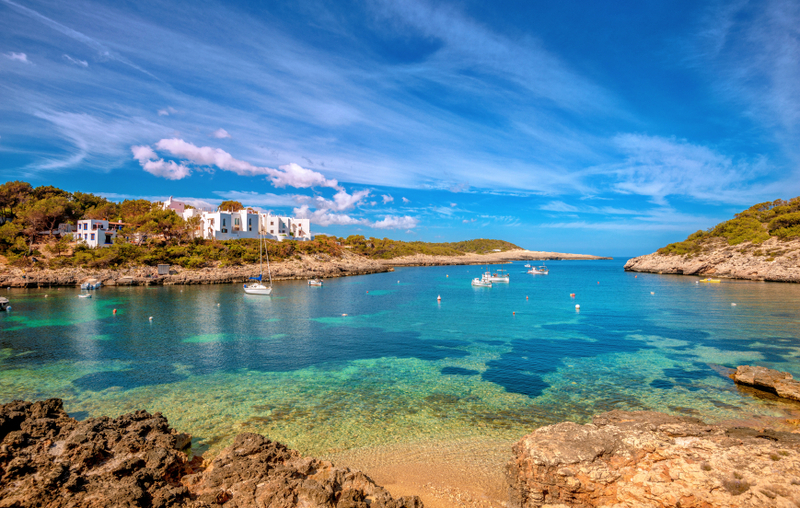 The Spanish islands of Majorca, Menorca and Ibiza have a well-deserved reputations for their sunny climate, stunning scenery and mouth-watering local cuisine. Majorca’s plus points include its elegant capital city of Palma and the idyllic beaches of Alcudia, while Cala’n Bosch in Menorca could be your perfect choice for a relaxing beach break. Ibiza holidays offer an excellent mix of beaches, fun and water sports and it’s easy enough to get away from the island’s famous rush of seemingly endless parties and nightlife. An island country and the birthplace of the god of love Aphrodite, Cyprus is said to have the warmest winter climate in the Mediterranean, making this a must if you don’t enjoy long haul sun-seeking. You’ll find sandy beaches, ancient sites, championship golf courses, breath-taking mountain trails and luxurious hotels. British visitors tend to warm to this island as cars drive on the left, red pillar boxes line the streets and you’ll find shops like Marks & Spencer—a legacy of the island’s colonial past. Temperatures in the Gambia rarely drop below 30 degrees centigrade year round, making it an alluring winter sun choice. Unlike in the UK, you’ll find almost non-stop sunshine and virtually no rain between November and June. It’s also much quieter than Mediterranean resorts and boasts plenty of stunning beaches for topping up your tan. Portugal’s beautiful Atlantic outpost is closer to Africa than Europe and is situated just north west of the Canary Islands. Most importantly, it has average daytime temperatures of 20 degrees centigrade in the winter and gives you a dose of sunshine to eliminate those winter blues! Visit the capital Funchal and its charming cobblestoned old town, sail around the coast of the island or simply take a luxury bus tour. It’s also worth noting that the capital stages the world’s biggest fireworks display on New Year’s Eve and its Christmas illuminations are second to none. South Africa is in the same time zone as the UK so you’ll be glad to know you won’t get jet lag if you’re planning to visit. Flights and accommodation at safari lodges are less pricey in the winter, which is great news if you plan on seeing the big five: lions, elephants, buffalo, leopards and rhinoceros. The resort city of Cape Town is one of the more popular destinations in South Africa, and boasts pristine white beaches, a bustling urban centre and stunning panoramic views from Table Mountain. It’s not called the Sunshine State for nothing! Florida has an excellent winter climate and the highest average January temperatures in the USA. As for South Florida, it’s subtropical and balmy all year round. Add to this the fact there are more beach resorts in the Gulf of Mexico than you can flick a towel at and you’ve got yourself the makings of a great winter get away. Plus, if you’re looking for the hottest temperatures, Miami is several degrees warmer than Orlando. Australia has a plethora of winter-blues busting destinations—just take your pick! Like all countries in the southern hemisphere, the continent’s seasons are opposite to those in the UK, meaning December to February is Australia’s height of summer. Try the popular tourist resort of Cairns, when the UK winter months are the best times to visit and bask in the sunshine. You can also snorkel in the Great Barrier Reef or take a scenic railway to Kuranda. On the other hand, Sydney, with its Opera House, Harbour Bridge, beaches and museums, is another top destination. The sun-kissed tropical island of Sri Lanka has it all: sun drenched beaches, tons of elephants, adrenaline pumping adventure sports, eight UNESCO World Heritage Sites and some of the oldest cities in the world. Other highlights include the capital Colombo, the Temple of the Sacred Tooth Relic, the Aukana Buddha and the Bundala National Park. Yes you knew the Caribbean would be in here somewhere didn’t you! Soak up the rays in a tropical climate where the sun blazes down for eight hours a day and temperatures hover in the high 20s. There are over a dozen islands, all offering different languages, cultures and climates to suit all tastes. Although the warmest islands are listed above, you may also want to visit the Bahamas, the Dominican Republic and Curacao, who all pack a punch in the winter sun department. Feeling a bit warmer now? If you’re inspired to chase that summer sunshine all around the world, why not take a look at our latest travel offers.